World Cup is back again after last season in South Africa, and for this year, Brasil 2014, we’re looking for the (designs of) free download of the World Cup 2014 Vector Logo, Mascot, Teams Jersey and Official Ball name Brazuca. These are one of the 32 Teams Jersey designs set in vector format available for free download, made by KevLag, student from France. The official World Cup 2014 ball is Adidas Brazuka. The name was selected by public vote organised by local committee of Brasil and Adidas in 2012. An artist illustration of Brazuka ball. This year we can see FIFA showing almost all of the World Cup Poster designs since 1930 before the first World War I. Note: 1942 – 1946 not available, we stuck in World War II. Credit to: FIFA – owner of the World Cup and all of their registered and trademark properties. Note: All FIFA images and file download links which are the property of FIFA was removed. 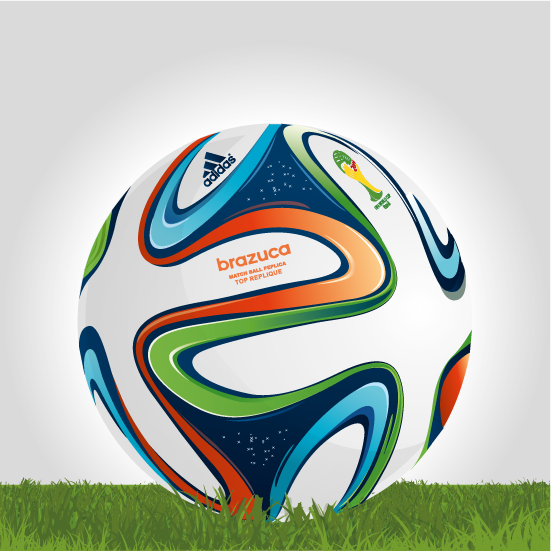 I really like the official logo & the ball name ‘Brazuca’. Thanks for sharing. Bra what..? ☺ yeah lets get 1 brazuca ball, how much huh..? Wow.. nice beautiful jersey. i have brazuca. I prefer the 2006 ball.